The vaults of the former Greek royal family are filled with heirloom jewels, but a number of the pieces they own today came from the Danish royal family through Queen Anne-Marie. Today's tiara, the Antique Corsage Tiara, was the first tiara she ever owned. The tiara that was given to the future Greek queen began its life as another piece of jewelry: a corsage ornament (or stomacher) that belonged to Queen Victoria of Sweden, Anne-Marie’s great-grandmother (hence the piece’s usual name). The corsage was inherited by Victoria’s granddaughter (and Anne-Marie’s mother), Queen Ingrid, who was born a Swedish princess. Ingrid wore the piece, which is made of diamonds and pearls, as a necklace and as a brooch; it was she who had the piece mounted on a tiara frame as a gift for her daughter. Anne-Marie received the tiara on her eighteenth birthday in 1964. But not even three weeks later, she wasn’t a Danish princess anymore — she turned eighteen on August 30 of that year and married King Constantine II of Greece in Athens on September 18. But although as queen she had access to many of the large and historical diadems of the Greek royal family, Anne-Marie still wore her birthday tiara on occasion. When her own daughters, Alexia and Theodora, grew to adulthood, they too wore their mother’s tiara at various royal events. 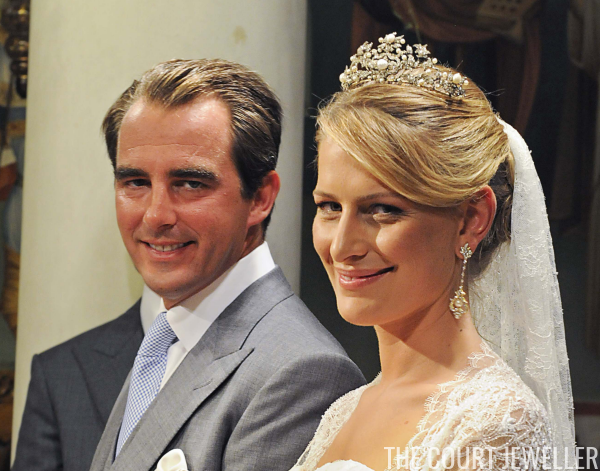 In the photo above, Princess Theodora wears the tiara at the wedding of her cousin, Prince Joachim of Denmark, in 2008. In recent years, the tiara has also become something of a secondary wedding tiara for the family (with the Khedive tiara, of course, on reserve as the wedding tiara for all of Queen Ingrid’s female descendants). 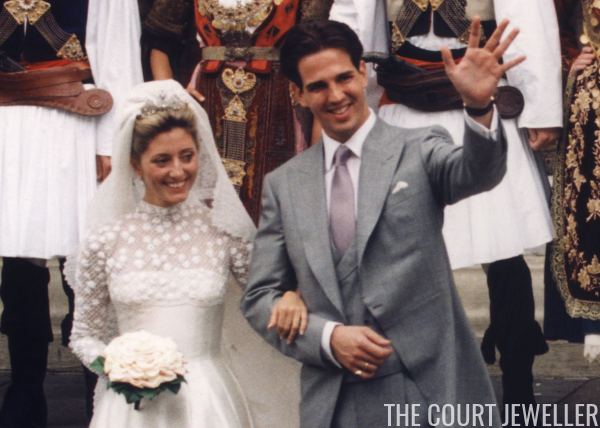 Above, Marie-Chantal Miller wears the tiara at her wedding to Crown Prince Pavlos, Anne-Marie's eldest son, in 1995. Anne-Marie's other daughter-in-law, Tatiana Blatnik, also wore the tiara on her wedding day; she married Anne-Marie's second son, Prince Nikolaos, in 2010. I imagine we might see it once more on a bride if Prince Philippos, her youngest son, marries in an elaborate ceremony. We also saw this tiara on Princess Tatiana in 2013 at the wedding of Princess Madeleine of Sweden -- an event that brought the tiara back to one of its earlier royal homes.